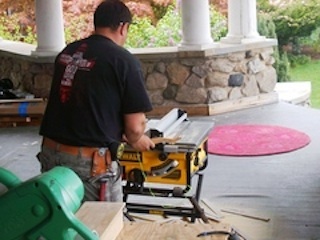 In these tough economic times, many home owners, when faced with the decision of making home repairs, or home remodels, are choosing to conduct the work themselves, rather than spend the money on a contractor. However, unfortunately, many individuals are unaware of the dangerous toxin that can be found in many homes constructed before 1980: asbestos. California Mesothelioma Attorney Michael Mandelbrot, is concerned that most home owners don’t appreciate the danger posed by the mineral. The mineral fiber asbestos was discovered more than 2000 years ago. It’s name was provided by the Ancient Greeks, who marveled that the fiber could not be extinguished by flame. But even the Greeks noted that the fiber caused lung problems in the slaves who were tasked to weaving it into cloth. Asbestos use became popular in the 1800’s, and the start of the Industrial Revolution as insulator for high temperature equipment. Given society’s struggles with other health ailments caused by crowding large populations into urban environments during this time period, it is thought that the ailments cause by asbestos were often misdiagnosed as other more common maladies, such as pneumonia. The first diagnosis of asbestosis, a chronic thickening of the lungs making it difficult to breathe, is widely believe to first have been made in 1924. In the 1930’s, scientific epidemiology clearly started defining asbestos as a threat to public health. However, asbestos continued to be used in the United States, to large extent in naval military applications, and in construction materials, into the late 20th century. Moreover, despite the anger of many families who have lost loved ones, asbestos use in not banned in the United States today, but rather is regulated, and curbed by the industry exposure to lawsuits brought by those suffering from asbestos related diseases, including pleural mesothelioma, a cancer widely accepted an incurable. Insulating blankets or paper, that wrap steam pipes, boilers, and heating ducting. Vinyl floor tiles, sheet flooring, or the adhesives used to apply flooring materials. Removing these asbestos containing tiles, asbestos sheet flooring, or scraping and sanding old adhesive material, can cause the release of asbestos fiber into the air. Sound proofing or decorative material sprayed on walls and roofs, such a textures of popcorn ceilings. Drywall materials, including joint compounds and drywall compounds. Roofing shingles, and home siding. not to disturb the asbestos containing materials, and to call a contractor who is licensed in the specialized process of removing asbestos. A certified asbestos abatement contractor can be found in California, by calling (510) 286-7000. If you or a loved one is already suffering from mesothelioma, lung cancer, or an asbestos related disease, and are in need of legal assistance, the Asbestos Legal Center (asbestoslegalcenter.org) is providing free consultations, at 1-800-970-3878.